With Frank Underwood gone, can Claire keep her house of cards standing? Has the House of Cards TV show been cancelled or renewed for a seventh season on Netflix? The television vulture is watching all the latest TV cancellation and renewal news, so this page is the place to track the status of House of Cards season seven. Bookmark it, or subscribe for the latest updates. Remember, the television vulture is watching your shows. Are you? A Netflix political drama, House of Cards stars Robin Wright as President Claire Underwood. Michael Kelly, Jayne Atkinson, Patricia Clarkson, Constance Zimmer, Derek Cecil, Campbell Scott, Boris McGiver, Diane Lane, Greg Kinnear, and Cody Fern also star. Season six introduces sibling moguls Annette and Bill Shepherd (Lane and Kinnear), who have a complicated past with the Underwoods, as well as Annette’s devoted son, Duncan (Fern), a rising DC power player. The Shepherds harness the power of their inherited company, Shepherd Unlimited, to influence American politics and bend the country toward their shared vision. On October 30, 2017, Netflix announced House of Cards would end with the sixth season, following sexual assault allegations against Spacey. Is there a spin-off in the works? Stay tuned for further updates. We don’t have to wonder whether Netflix will cancel or renew House of Cards for season seven, since they already decided to end it with the sixth season. In the fall of 2017, when the Spacey scandal peaked and production was shut down, Netflix was mulling over a spin-off with Michael Kelly’s character, Doug Stamper. I’ll keep an eye on the trades to see if anything comes of a sequel series. Subscribe for free updates on any House of Cards news. Find more House of Cards TV series news or other Netflix TV show news. What do you think? Should Netflix have cancelled or renewed its House of Cards TV series for a seventh season? Would you have watched another season of TV show without Kevin Spacey? 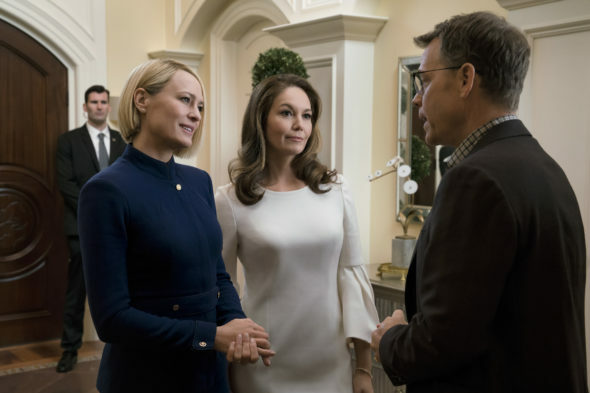 More about: House of Cards, House of Cards: canceled or renewed?, House of Cards: ratings, Netflix TV shows: canceled or renewed? Plenty of material left to explore in season 7. Lets go full speed ahead for a Season 7 House of Cards, Netflix! Have heard cast and crew have been told late October start date. Yes, should be renewed. Brilliant writing, and acting. Such a treat from regular to programming. Please please allow season 6 I absolutely love this show! You can’t leave it hanging like that! We need season 6! I’m just attempting….unsuccesfully cuz it’s my 3rd time tryn….to sign up to be notified on wethr House of cards will b renewed for a 6th season. I hope it will & can’t imagine why it wldn’t ( except for the fact that normally foolishly predictable shows get renewed & smart, original shows get canceled)but, let us hope that’s not the case here. Please renew, I love this show. Please renew, I love this show!!!!! Please renewed Netflix people of start watching continued to watch it best show ever seen in my life. Many more to come love Netflix disappointed if let it go which going it go to continue hopefully it will. Please renewed for another season very good this season more need get to more to watch it and stopping making ratings system now on Netflix streaming services that annoys so don’t know how doing now.